We have two varieties of road dinghy trailer available, the first type of boat dinghy trailer is fitted with solid rubber snubbers as shown above. All adjustable to ensure they fit your dinghy perfectly, the vee snubbers fitted to the drawbar are also adjustable along the body the boat trailer. 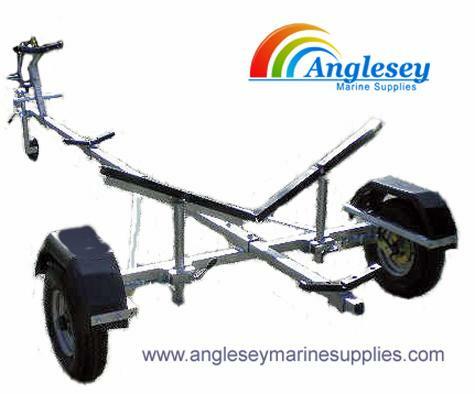 The second type of dinghy trailer available is fitted with keel rollers and non marking side boat trailer rollers to ensure easy launching and retrieval. A perfect boat trailer for a small rib or inflatable boat. Please use drop bar menu when choosing the type of dinghy trailer you require. 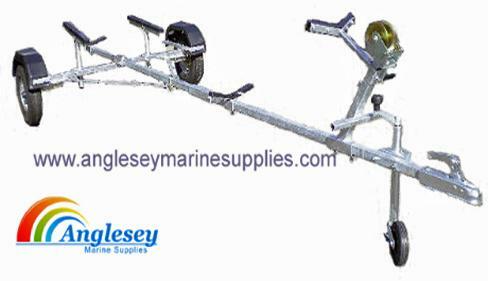 Small Boat Trailer, Dinghy Trailer has hot dipped galvanized steel chassis with adjustable length drawbar. Is supplied with winch post and winch. Fitted with pressed steel 50mm ball towing hitch. Wide 30cm adjustable side supports, adjustable height keel support bracket that will also adjusts along the drawbar. Single axle with 400 x 8 4 ply wheels and tyres. Draw bar comes in 2 parts for stowing away when not in use. Weight is 65kg. Fitted with 350kg units. Overall length is 11’. Width is 5’. Dinghy trailer is Ideal for inflatables, small ribs, tenders and boats. The whole trailer breaks down into kit for sending by carrier or for stowing away at the end of the season. A very cost effective yet durable boat dinghy trailer. Also fitted with boat trailer rollers if required at no extra cost. Very lightweight, can also be used as a launching trolley/trailer. will arrive flatpacked requires assembly. 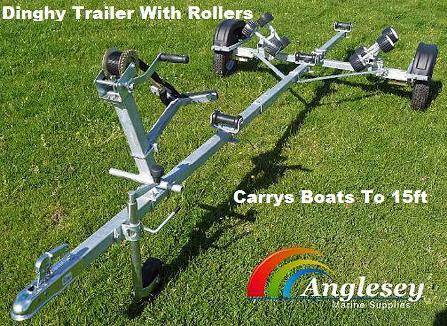 A quality small boat dinghy trailer fitted with boat trailer rollers.